ZZOOMMBBIIEESS!! I love 'em. One of my absolute favorite things to draw. 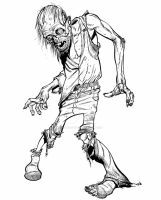 I could fill up page after page of nuthing but zombies. oddly enough, my brother writes zombie haiku on his website. Thank you very much! All it is, is just a matter hours put in. You put in enough, you'll get where you want to go. It's just a matter of how much work you want to put in. Now, get to work! Thanks, yeah, Zombie haikus. they are very good though.